It gives me immense pleasure to be here today for the fourth Convocation of Babasaheb Bhimrao Ambedkar University, whose foundation was laid in 1989 by our young Prime Minister, Late Shri Rajiv Gandhi. Established by the Government of Uttar Pradesh, it became a Central University in 1996. This University is named after one of most outstanding personality and India’s key architects, who was a great visionary, an inspiring leader, a radical thinker and a brilliant scholar. I take this opportunity to pay my respectful tribute to this great man of India, Babasaheb Ambedkar. Dr. Ambedkar was a champion of the democratic principles of liberty, equality, fraternity and justice. He was firm in his commitment to the transformation of India and it’s society, both economically and socially. Taking a cue from the ideals he espoused, this University, I am told, is pursuing an innovative blend of educational and social objectives. This is reflected in its academic programmes that comprise Information Science and Technology, Management Studies, Home Science and Ambedkar Studies. Education is a crucial element for national progress, human empowerment and social change. The rising incidents of crime against women and children call for effective measures to ensure their safety and security. It also calls for arresting the moral decline in our society. We must find solutions for bringing such degradation of values to an immediate halt. Our universities, that possess the capability to shape the minds of the youth, should set the process of redefining our moral values in motion. These temples of higher learning must act as guides in meeting the contemporary moral challenges and ensure that our civilizational values of compassion for all; love for motherland; respect for women; truth and honesty in life; discipline and self-restraint in conduct, and responsibility in action are fully entrenched in the minds of the young boys and girls. Dear students, we are on the verge of a demographic revolution as the proportion of working-age population is expected to be more than 64 per cent by 2021. Between 2011 and 2016, the working age group will swell by 63.5 million persons. This dynamism in our population structure is for us to reap if we can make our young people healthy, educated and skilled. Our education system should play an enabling role to transform this demographic expansion into a great national asset. The progress made by us in the higher education sector is significant. There are over 650 degree giving institutions and over 33,000 colleges in the country today. During the Eleventh Five Year Plan period, 65 new Central Institutions, including 21 Central Universities, were established. Except for one state, there is at least one Central University in every state of the country. Despite this, we continue to be challenged by problems of quantity and quality. The number of quality academic institutions in India is quit inadequate, due to which, many meritorious students go abroad for higher education. There are more than 2 lakh Indian students studying abroad, including US and UK. It will be our undoing if we cannot draw our students to seek higher education in their own country. The quality of education imparted in our higher educational institutions leave a lot to be desired. There is a need to change the mechanics of rendering education and the time for it is now. Our universities must deliver education of international standards. Every university should identify one department that can be developed into a Centre of Excellence. I call upon the Central universities to spearhead this transformation. 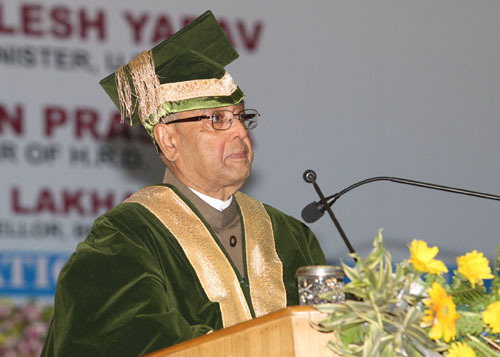 Keeping in mind the need to effect innovative changes in the higher education sector, a conference of the Vice Chancellors of Central Universities was organized in the Rashtrapati Bhavan in February this year. The conclusions arrived at the Conference on the immediate, short-term and medium-term measures to bring the necessary changes in the education system are being worked upon by the Ministry of Human Resource Development. I hope that by the time we commence the next Conference, substantial progress would be on our cards. Increasing the access to higher education is a necessary step towards inclusion. It must be made affordable for meritorious students from economically difficult background through scholarships, student loans and other student-aid measures. Many places in our country are devoid of a higher educational institution in their vicinity. Our efforts must be directed at bringing higher education closer to our population by resorting to innovative techniques of education delivery. The facilities provided by the National Mission on Education through Information and Communication Technology should be utilized on a greater scale. With technology, collaborative information sharing is possible. It will be easy to transmit important lectures to students studying in institutions situated far away from the urban centre. Knowledge sharing and consultation is the edifice on which inter-disciplinary, inter-institutional academic cooperation can be built up. An important facilitator for this is a reliable electronic platform. The National Knowledge Network envisages connecting 1,500 knowledge generating institutions through high speed broad band network. I am happy to note that about two-third of the institutions have already entered the network. I am confident of speedy connection for the remaining institutions. Faculty is a crucial element of our education system. It is a worrying sign that many faculty positions in universities remain vacant for quit some time. In Central Universities alone, vacancy is about 38 per cent. The existing shortage of teachers could negate our efforts at quality enhancement. Immediate steps should therefore be taken to fill up the vacancies. Our teachers must be equipped with the latest information and knowledge. The refresher courses conducted by the Academic Staff Colleges warrant a more frequent review to retain their relevance to contemporary teaching. There are teachers who motivate students to think from different perspectives. These teachers can spur holistic learning and new thinking. Our universities should be able to identify such ‘inspired teachers’ and encourage them to mentor junior teachers and students. In a world marked by increasing constraints on natural resources, innovation will be the key to future growth. China and the US are at the forefront of innovation with over 5 lakh patent applications filed by each country in 2011. India, with only 42,000 patent applications, lags behind these leaders. Our academia and the industry have a lot to contribute towards innovation activity. As per an international survey, only 3 Indian companies are amongst the world’s 100 most innovative companies. In our academic institutions, research is low on preference. Only 0.4 per cent of the 260 lakh students enrolled at under-graduate level and above in 2011-12 were PhD students. The Science, Technology and Innovation Policy, 2013 has envisaged a science and technology led innovation to drive India’s future development. The onus is on our higher educational institutions to make use of this policy to consolidate our standing as a knowledge economy. This decade is the decade of innovation. Innovation will carry meaning only if it translates into benefits for those at the bottom of the socio-economic pyramid. In the Conference of Vice Chancellors of Central Universities held this year, a recommendation was made to set up Innovators Clubs in the Central Universities to facilitate interaction between the teaching and student communities and grassroots innovators. I am glad to note that this University has set up such a club. I congratulate all those involved, including the National Innovation Foundation, for taking this step. I am sure this initiative will soon reach all the 40 Central Universities. There are many grassroots innovations that, due to lack of technological and commercial support, remain denied of development into marketable products. Mentoring of grass root innovators by universities and industry would help in taking the benefits of technology closer to the people. I look forward to seeing some of the exciting new innovations on display in the Innovation Exhibition today. We must build an academic environment conducive for research. We must increase the number of research fellowships, support inter-disciplinary and inter-university research partnerships and establish industry incubation parks./ The talent deficiency in academic and research positions is a matter of concern. Our system should have adequate flexibility to attract Indian researchers working abroad to return and work on short-term assignments. I hope that the education you have gained will make you reflect inwards and facilitate your engagement with the world outside. Young students, when you leave the portals of this great institution, the advise of your seniors and teachers will no longer be available, but you need not feel desperate, you need not feel lonely, you need not feel scared because the knowledge, skill and confidence injected in you has made you competent enough to face the challenges of life. So, march ahead:- future is yours, World is yours. In your onward march, you have my best wishes for your life and career.